The Vince Lombardi Trophy - Vince Lombardi goes down as one of the greatest and most successful coaches in NFL history. The trophy is awarded to the Super Bowl Champion of the National Football League. The Stanley Cup - Lord Stanley of Preston was the Governor General of Canada in the late 1890's and awarded a memorial cup to Canada's top-ranking amateur ice hockey club. The cup is now awarded to the Stanley Cup Playoffs Champion in the National Hockey League. The Heisman Memorial Trophy - The award was created in 1935 by The Downtown Athletic Club in honor of the passing of their former Athletic Director John Heisman. The trophy is awarded to College Football Bowl Subdivision's Most Valuable Football Player. 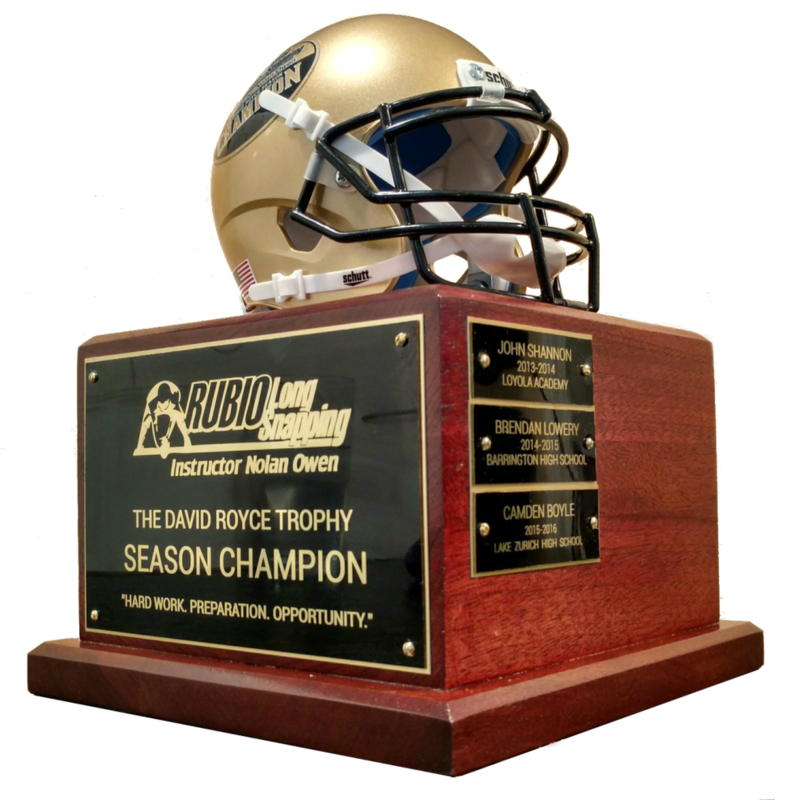 "The David Royce Trophy" is a perpetual trophy that is awarded to the David Royce Season Champion. A Rubio Long Snapper is named Champion after achieving the most weekly competition wins at Rubio Long Snapping Instructor Nolan Owen Lessons. For a long snapper to accomplish this achievement it requires an intense amount of hard work, relentless preparation, and successfully capitalizing on their opportunities. Values that were embedded in Coach Nolan's childhood by his father Dave Owen. Dave introduced Nolan to football at a young age. However, he did not encourage Nolan to play until the High School level. After visiting Training Camps for the San Diego Chargers and Dallas Cowboys, Dave pointed out the long snappers for both teams and said "That is the fastest way into the NFL. Plus you get to hold the ball every play, not many players get to do that." Dave held Special Teams play with high importance as he was one of the few high school soccer style kickers in the 1970's. After extensive research and many long talks with his dad, Nolan made it his life's dream to long snap for a College Football Program at the Division 1 level. Knowing that long snapping required technique and form training, Dave committed to extra work to afford weekly Rubio Long Snapping lessons for Nolan. Dave's support and commitment to help Nolan achieve success exemplifies the kind of love that surrounds the Rubio family today. In ending, The "David Royce" Trophy is in honor of not only Nolan's father, David Royce Owen, but to all the parents of our long snappers.